Norwegian producer Lindstrøm's complex live rig has to be dependable, and so should yours be. 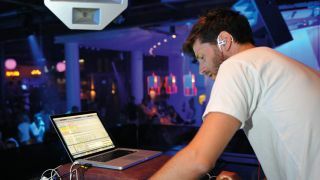 A major contributing factor to Ableton Live's success when it first launched in 2001 was its innovative Session View, a gloriously non-linear loop playback and manipulation interface via which rough ideas could be knocked about as the basis for full arrangements, and - more importantly, it turned out - full tracks and samples could be mixed by DJs into fluid, wildly creative live performances that went far beyond anything that had ever been possible using traditional turntables or CD decks. But the Session View isn't just for mixing complete stereo tracks into each other - it can also be used to take total control of finished Live projects, enabling on-the-fly rearrangement and remixing, whether for your own edification or that of the baying crowd. With these performance tips firmly installed in your brain, your Live sets will be more creative, more stable and just more better than ever. Don't ever do anything during your live set that runs even the slightest risk of making Live hiccup or crash! Apart from the obvious suggestion that you do a few dummy runs before firing it off at an unsuspecting audience, if you do find the nerve to drag any plugin instruments or effects into the project during playback, either stick with Live's own devices (which are bomb-proof in our experience), or those that you know to be completely stable. Also, only use low-latency effects - preferably Live's own - to avoid timing issues and glitches when loading, and don't touch any latency-related parameters such as lookahead. If your audio interface offers it (which it almost certainly will), do be sure to take advantage of direct monitoring when recording audio clips on the fly. You won't be able to monitor with plugin effects in place, but the audience will hear them, and unless your processing chain is particularly bonkers, you should be able to successfully do your thing without them. Zero-latency monitoring when playing live is - most of the time - far more important than the player being able to hear the final front-of-house sound. If you just can't handle hearing yourself totally dry, though, some interfaces include 'core' DSP effects (reverb, delay, compression, EQ, etc), which can be applied to the direct monitoring signal -better than nothing! When performing live on a computer, you'll want to do everything you can to maximise your visual stage presence. No, no, no… put the giant foam pointy finger and 'mad for it' jester's hat down - that's not what we mean. We're referring to such things as exciting-looking instruments (electronic drums, keytars, etc) and motion control systems. These days, the latter - which enable you to control anything capable of receiving MIDI CCs by moving your hands in front of a sensor or camera, or using an accelerometer-equipped transmitter to beam movement data back to a receiver attached to your computer - are more affordable than ever. If you've got an iPad or iPhone, IK Multimedia's iRing is well worth a look; and if you haven't, there's the Hot Hand USB, amongst other dedicated systems. MIDI learn some effects controls and wave 'em like you just don't care! One of Live's most interesting and powerful live performance features is Follow Actions. We've not covered this nifty system in the main text because it's aimed more at 'generative sound installations' than on-the-fly remixing of existing arrangements, but if you want to add an element of chance-based clip triggering to your gig, it's well worth experimenting with. By assigning a Follow Action to a clip, you instruct it to trigger another clip from within the same Session View column when it finishes playing, options including Previous, Next, First, Last and Any (random). Two Follow Actions can be assigned at once, with the relative likelihood of either one triggering being adjustable, and possibilities for their usage within an otherwise 'planned' set could include dropping in randomly selected drum fill variations or spot FX at regular intervals, or rearranging chord progressions on the fly without compromising their overall tonality. If you don't intend to perform any live melodic parts within your set, but do need the ability to trigger spot FX, you might as well go for a set of trigger pads rather than a MIDI controller keyboard. Not only are pads more satisfying than keys to strike out at for such purposes, but with fewer of them in place (eight or 16, usually) than the minimum 25 keys of a keyboard, keeping track of them should be easier, too. Native Instruments' Maschine Mikro, Akai's MPC Element, Arturia's Beatstep and IK Multimedia's iRig Pads are all fine and affordable examples. Fancy taking your live Live sets to the next level? How about mixing a series of them, two at a time, DJ-style? 'Simply' get two laptops, both running Live, and slave one to the other so that they run in sync (via dedicated MIDI interfaces or ports on MIDI controllers); hook their outputs (either built-in or via audio interfaces) up to a DJ mixer; load a separate Session into each and crossfade between your real-time remixes as desired! The headphones situation could get a bit confusing, so we'd suggest leaving out any on-the-fly auditioning and recording of new parts - unless you want to make things really complicated by factoring in a headphone mixer. For a rather less hectic option, substitute the second laptop for your phone or tablet and just alternate your mix between Live jams and straight playback of regular tracks (giving you time to load up and prepare the next Live set).